Got another great day at LEGOLAND. I'd like to highlight the experience of yesterday at 'Power Builders' entertainment. Everything starts standing in front of a computer, where you can select the speed of the movements in a scale from 1 to 5 an then choose a sequence of 6 movements, from a list of 14. With all these, you can combine from a smooth experience to a really stressing one! 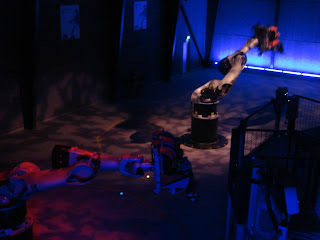 So, you get involved by the 'Technic' and get immersed into an amazing and a few G experience (I believe). After all, I took a ride into the park 'X-Treme Racers' roller coaster. It looks like you took to ride an 8466. Anyway, those must have been some great moments there. I haven't lost hope of one day hopping there for a vist! When I went there I put the power level on 5 and chose the hardest maneuvers. Unfortunately my dad forgot to film it XD. No food came out of my mouth luckily, but I almost forgot to remove my glasses before the ride started. What would YOU like to see from TECHNIC? Minimotor - A great custom motor!